Grab that McDo Sundae Cone! 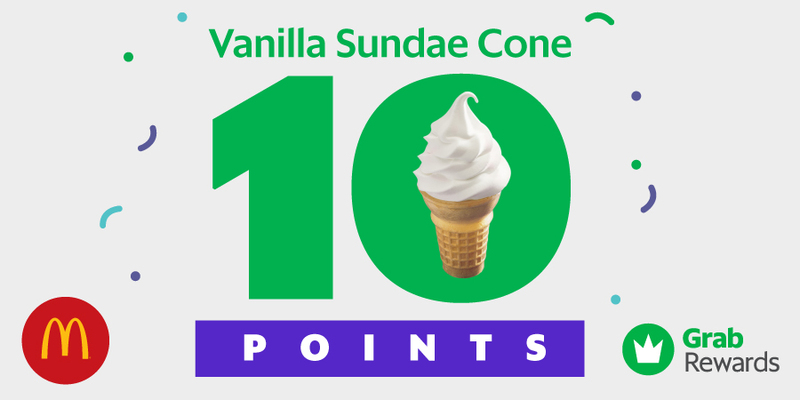 Grab a McDonald’s Vanilla Sundae Cone for 10 points only! Hey, it’s Friday! Why don’t you reward yourself with a McDonald’s Vanilla Cone Sundae! From 1pm to 4pm today at participating McDonald’s stores, you can exchange your GrabRewards points for a McDonald’s Vanilla Sundae Cone at 10 points only! Open your Grab App then go to GrabRewards. Select McDo Vanilla Sundae Cone from the GrabRewards catalogue. Go to the designated redemption outlet to claim your Vanilla Sundae Cone! McDonald’s Bankmer Building, Ayala Ave. The redeemed reward can only be claimed in ten (10) designated redemption stores as shown above. A maximum of five (5) Vanilla Sundae Cones will be allowed per GrabRewards user. Valid for dine-in and front counter take out transactions only. Points are non-refundable and non-transferable upon purchase of the reward. Promo cannot be used in conjunction with any other promo or discount. Q: How many points do I need to redeem the Vanilla Sundae Cone? A: You only need 10 points! A: Yes. There is a maximum of five (5) redemptions per customer. Q: Can I redeem in stores other than the ones at BGC, Makati and Ortigas? A: No. The promo can only be redeemed at the participating stores. McDonald’s Greenbelt 1, McDonald’s Makati Cinema Square, McDonald’s Bankmer Bldg., McDonald’s Valero St., McDonald’s Shell Emerald, McDonald’s Tycoon Center, McDonald’s Rockwell Ortigas, McDonald’s BGC Forum, McDonald’s Bench Bldg., and McDonald’s 32nd Street, Taguig. Q: When can I claim the promo? A: You can only claim the promo on 17 August 2018 (Friday) from 1:00pm to 4:00pm. Q: What if I was not able to claim the Vanilla Sundae Cone on the said date? A: Unfortunately, the promo is only valid on 17 August 2018, and it is also non-refundable.